Love is in the air at Magallanes! 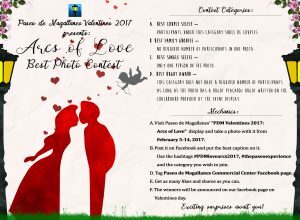 Paseo de Magallanes embraces the celebration of Valentines this 2017 by hosting a photo contest. 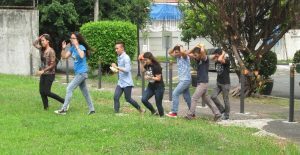 Come and visit Paseo de Magallanes Commercial Center and join our Arcs of Love 2017: Best Photo Contest. It’s easy! Simply take a photo with our Arcs of Love Valentines display, upload it on Facebook with a witty caption and include the event’s official hashtags #PDMLoveArcs2017 and #thepaseoexperience, tag the Paseo de Magallanes Commercial Center Facebook Page, and gather as many like and shares as you can. And that’s it! You’re a step closer to winning exciting prizes! Best Single Selfie – no date? No worries! Contest will start on Saturday, February 4, 2017 and winner will be announced on February 14, 2017 via our Facebook page. What are you waiting for? Snap your best selfie now at the Arcs of Love and you may be the lucky winner!